Star kids are group nothing like a normal child. It’s natural that they get used to spotlight early on and are very free, open minded and amazing kids. 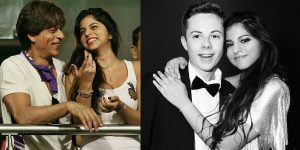 India’s one of the biggest star Shahrukh Khan’s daughter is nothing different. Shuhana Khan has been in some headlines for few times in past for various reasons. She is very talented and amazing girl who lives her life to her fullest. Like every daughter, she is also the life of her father Shahrukh Khan who loves her more than anything in the world even himself. Being daughter of such a legend, she gained popularity early on. She got a lot of fans over past few years. Shuhana Khan is very active on social media, and she keeps posting pictures. Her pictures are so cute and beautiful that it always wins the heart of millions. Recently a picture surfaced in which she is seen posing for the camera with an adorable, handsome boy. Who according to sources is her classmate in college. She looks gorgeous as always, and everyone is eager to know who this handsome young guy is. Talking about Shahrukh Khan, he is very fond of his daughter and keeps posting fabulous pictures of her on social media. He loves him more than anything in the world. With words so beautiful, he portrayed how much importance both lovely ladies have in his life. Currently, Sharuk Khan is in the US and is shooting for the movie ‘Zero’. This movie is directed by Anand L Rai, and it also has other stars like Anushka Sharma, Katrina Kaif, Abhay Deol and R Madhavan. The film will be releasing during Christmas this year, and that is 21st of December. We wish a very bright future to the young girl and a life full of happiness and success. We love her amazing pictures on social media.